Things always look better from 30,000 feet up. But that’s not where we live. We’re down here on the streets, hustling down sidewalks, picking up our family, or fighting through rush hour. The view down here is a lot more congested. Emissions from gas-burning vehicles are mostly invisible, swirling in the air as we go about our daily lives, and secretly impacting our health and well-being. Think about it: If you were to stop for one minute at three red lights a day, you'd end up inhaling over 18 continuous hours of noxious gases in one year. This can wreak havoc on your health over time. When people talk about emissions, they are really speaking about two separate things: greenhouse gasses and pollutants. The big difference? Greenhouse gasses contribute to global warming, and do not have much immediate affect human health on a day-to-day level. Pollutants, on the other hand, are what you’re choking on at a red light or crossing the street. What are these pollutants exactly? Particulate Matter : PM is public enemy No. 1. It’s the most closely-monitored air pollutant, with some of the greatest risks to human health. Particulates are a mix of hundreds of small solid particles that work their way into the respiratory system, where they cause a range of pulmonary and cardiovascular problems. Some can also cause cancer. They’re the most dangerous below 2.5 micrometers (PM2.5) in size - 30 times smaller than the width of human hair. Nitrogen Oxides : A secondary source of PM. These chemicals create smog and irritate your lungs. They are linked to many pulmonary and heart diseases and are a main source of particulate matter. Sulphur Oxides : Another secondary source of PM, sulfur oxides are produced by diesel vehicles, thermal power plants and other industrial processes. SOx also have adverse effect on the heart and lungs. Carbon Monoxide : A tasteless and odorless gas that reduces your body’s ability to deliver oxygen to your organs—making jogging and exercising outside more strenuous than it already is. Hydrocarbons : Unburnt fuel that evaporates or leaves your engine unused, it combines with other chemicals to form particulate matter. much higher than at measuring stations above "
With all that emission in the air, it's enough to want to duck and cover - or at least put a mask on. At the street level is where the danger lies, especially in traffic-congested cities. 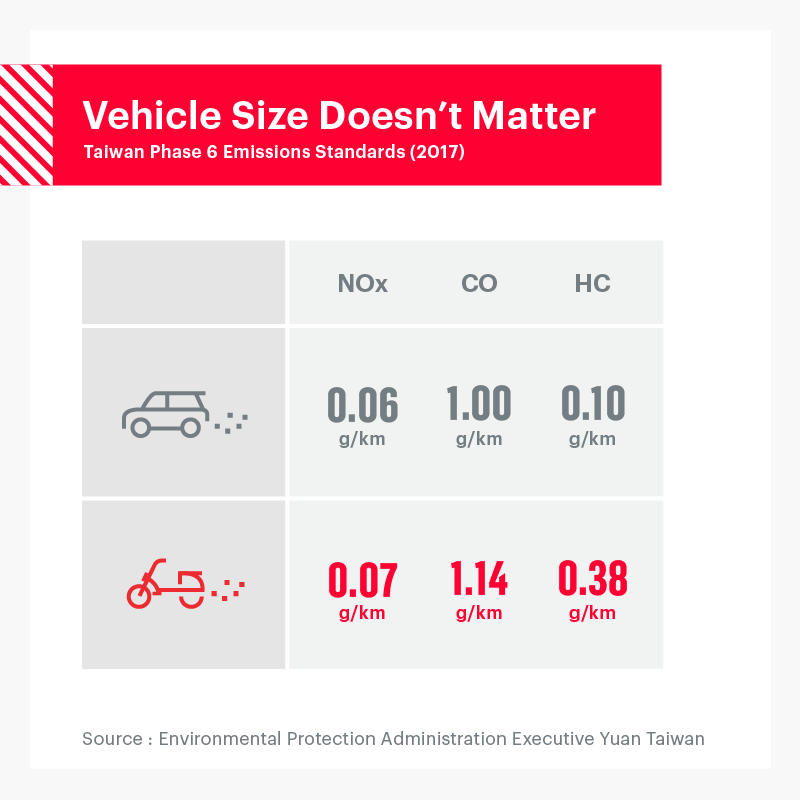 Data from Taiwan’s EPA shows that vehicles are responsible for almost a quarter of all of those dangerous PM2.5 pollutants in the air. What’s worse is when vehicles are inching along busy streets at rush hour - when intersections seem more like parking lots. During commuting times, the toxic vehicle-based pollutants are the most concentrated. Those iconic face masks you see many open-air commuters sporting? They are more than fashion accessories, but they may not be completely effective. Only a certified N95 type mask can protect you from fine particulates like PM2.5, and only when properly sized and correctly worn. 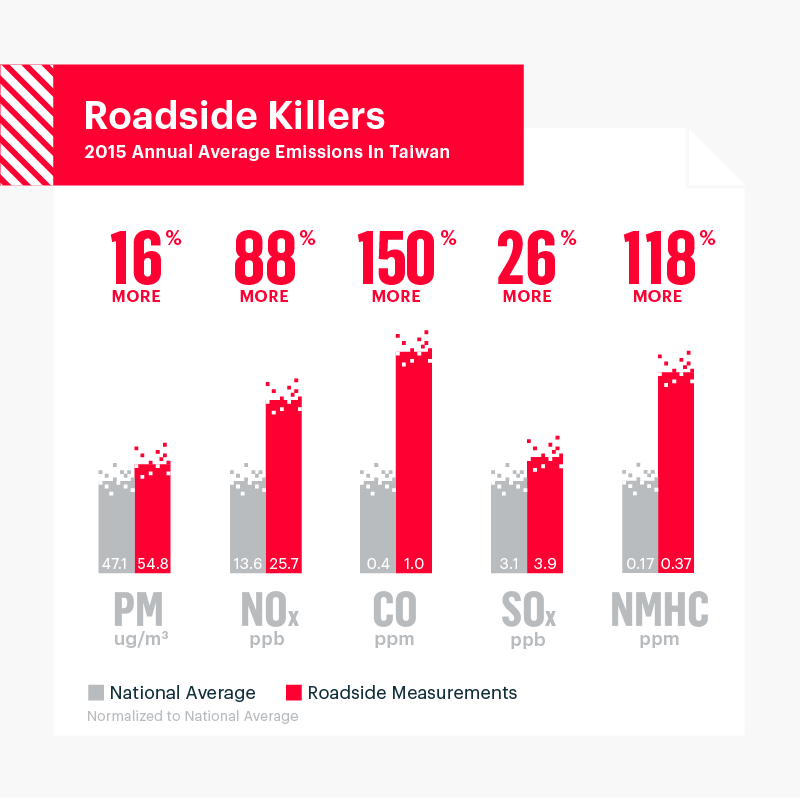 Pollutants at street level are far more prevalent than the measurements sampled above it, and here’s the data to back this up: the Taiwanese EPA tracks air quality at 75 stations around the country and publishes annual averages for those five key pollutants we covered above. It doesn’t take an Einstein to figure out that if there’s always a ton of PM2.5s around on the Taipei Bridge, in Times Square and below the Arc d’Triomph, it’s only going to ramp up more during morning and evening commutes. 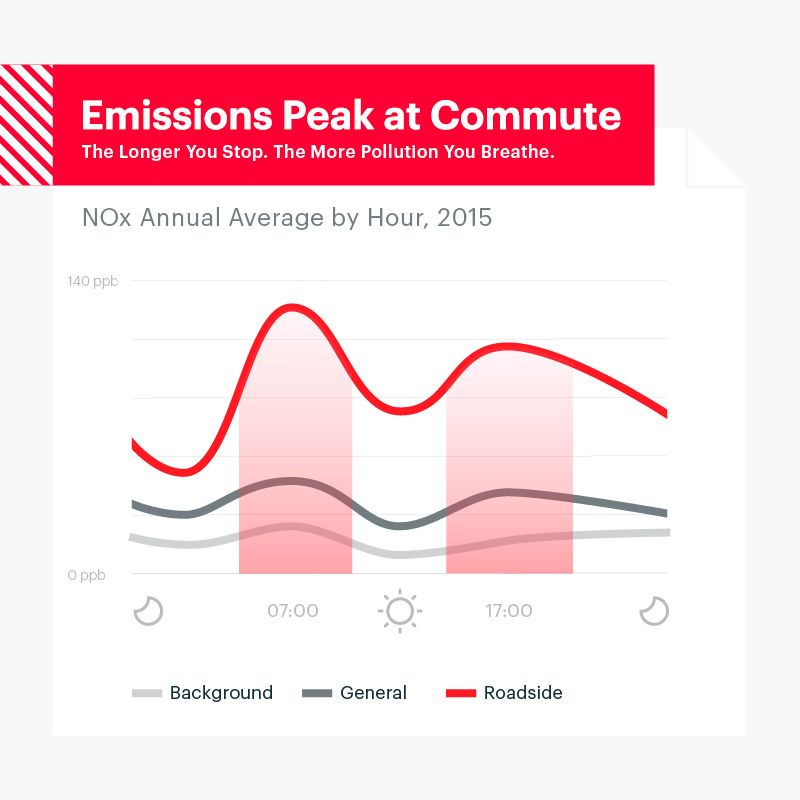 EPA data shows the nasty particulates boom during commuting hours across the entire country. Take this graph of Nitrogen Oxides, measured at the roadside (3 meters up), at general monitoring stations (15 meters up) and background air quality levels (e.g. pollution outside Taiwan). 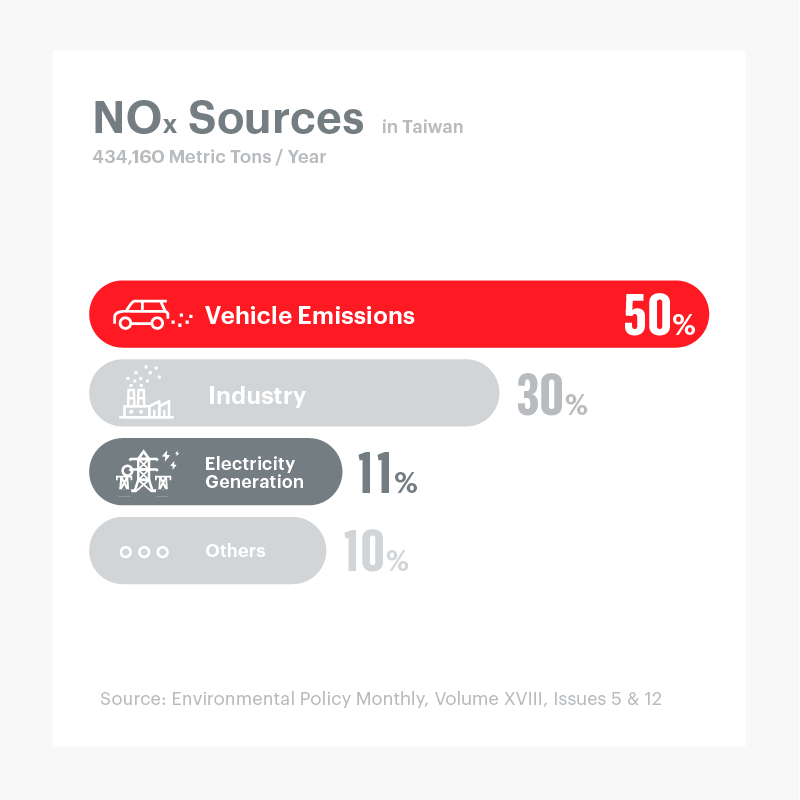 NOx is the most important pollutant for vehicles regulated in Taiwan, and the data is stunning. Not only are Nitrogen Oxide levels much higher on the streets, they’re markedly worse during morning and evening rush hours, doing damage to the lungs of everyone trying to make it from point A to B. So yes, the bad news? The air we breathe at street level can be the worst - and more than what a national or urban index shows holistically. The exciting news? Zero-pollution vehicles can make a big difference. We have to ditch gas-powered vehicles if we want to protect our health in the future. The solution is to go electric. nearly equal to or greater than a gasoline car "
Just like cars, your gas scooter contributes equal or more emissions. 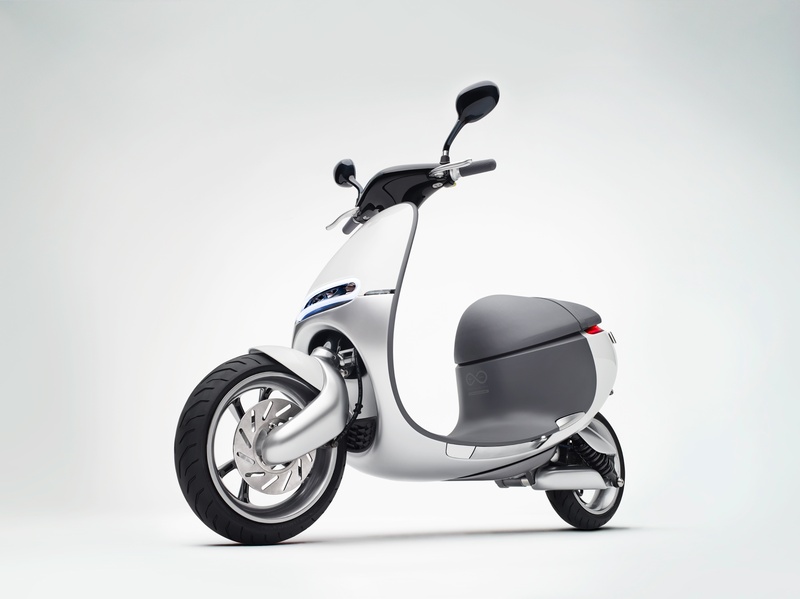 Before the Smartscooter®, there were relevant reasons to use a fossil-fueled scooter: they save space and fuel, and emits less CO2 than a car. The hidden downside is that because they’re small and inexpensively made, they don’t have a solid pollution control strategy. 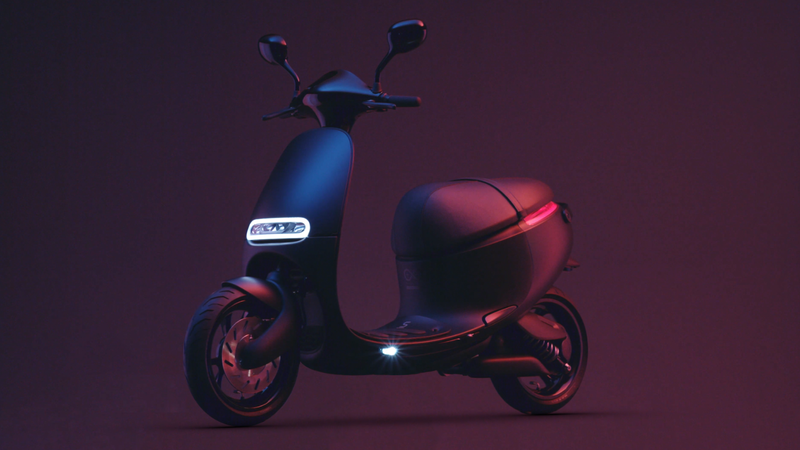 As a result, gas scooters create big-time pollution. 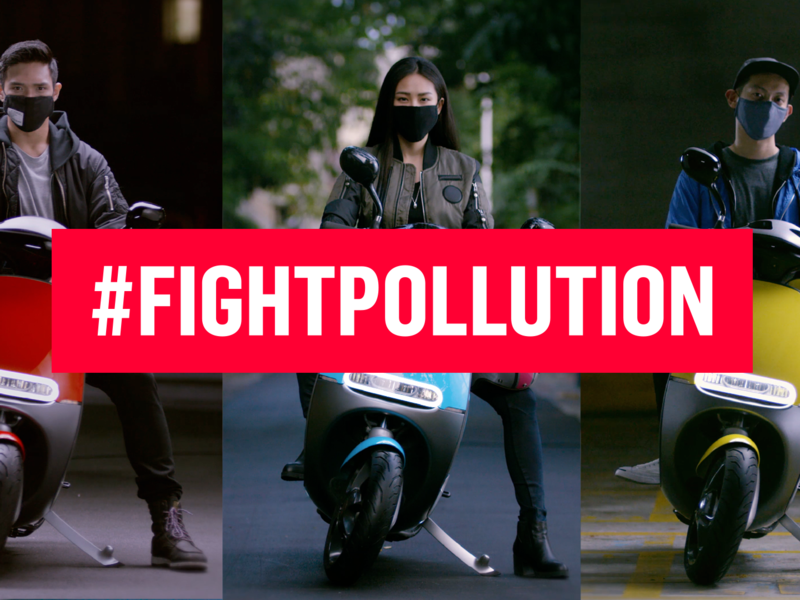 Check out Phase 6 - Taiwan’s 2017 emissions standards for scooters. The vehicles produced under these standards will become the newest, cleanest scooters out there, and yet for the same number of kilometers they will travel, gas powered scooters ultimately create emissions nearly equal to or greater than a gasoline car. This is not even taking into account older scooters created under far less rigid standards create pollution exponentially worse. Those faded grey, rusted out and sputtering dinosaurs need to become extinct fast. We hope the electric Smartscooter® - coupled with better government regulations - could be the asteroid to wipe them out. Moving to all-electric vehicles would do instant wonders for the levels of NOx and particulate matter in the air. It still takes fossil fuels to make the energy to charge electric batteries. 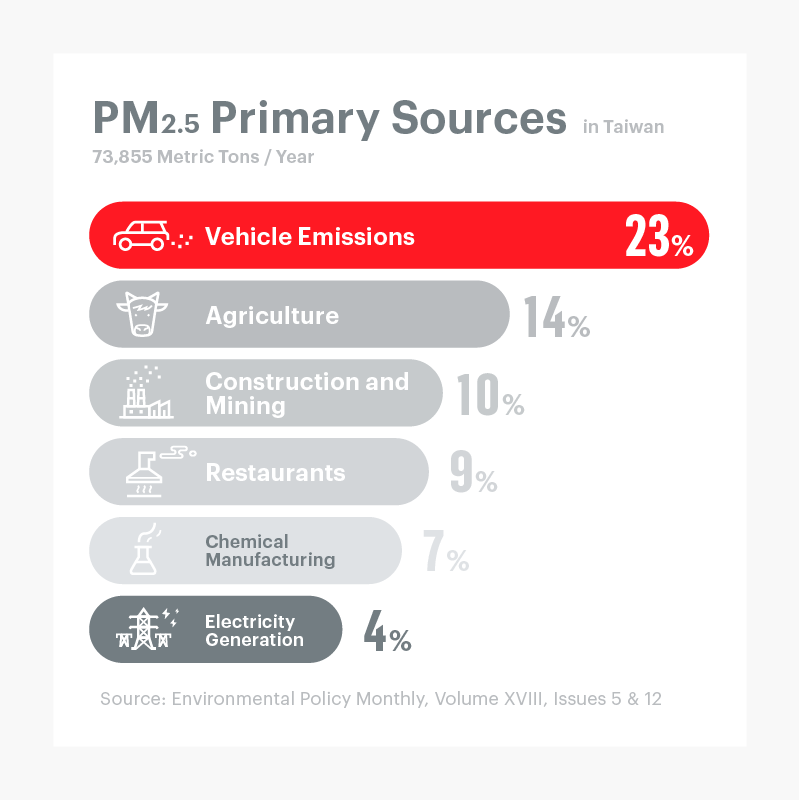 According to the Taiwanese EPA data, energy production accounts for 4 percent of the entire PM2.5 produced annually. Pollution data shows that half of NOx comes from sources other than vehicles, so we are not stopping there. 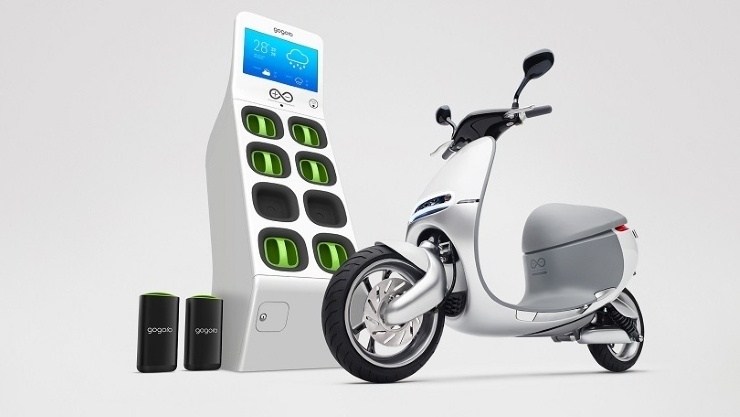 Gogoro is also pushing to transform energy production. A move from gas and coal to solar and wind-based electricity would mean a big, deep breath of relief from pollution. This isn't to say don’t ignore the small stuff like installing energy-efficient light bulbs and turning down the AC. Every bit of effort helps. Just remember: we all have to think big. 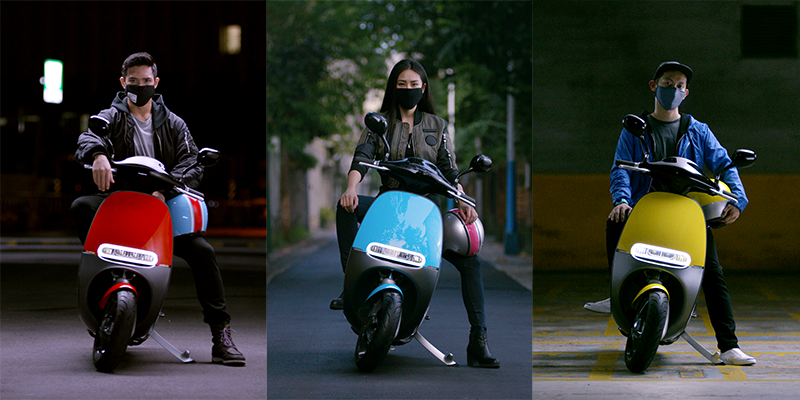 Gogoro offers zero-emission Smartscooters® we hope you’ll love. But after you've reviewed the big picture, we simply want you to invest in the sustainable transport that works for you. When you do buy, buy electric. It’s a choice that affects the next decade as a new gas vehicle has a 10-13 year lifespan of using energy and creating emissions. Go electric and you will change the air quality at street level immediately. Start the change from the ground up. Start now.